This might be a case of "it's-not-you-it's-me" - but I was not feeling this book. I really enjoyed The Glittering Court, but I didn't feel the same enthusiasm while reading this book. It could have been a number of factors, but ultimately, I think this book wasn't as great as its predecessor. It could have been me, but I don't think that is why I didn't love this book. This series is a companion series, in which each book features a different protagonist. However, each book takes places simultaneously - for example, the storyline of The Glittering Court runs parallel to the storyline of Midnight Jewel. We see Cedric and Adelaide fall in love (from a distance though), and we see them get sent to the colony, and so on, as was told in The Glittering Court. Midnight Jewel is Mira's story, told from Mira's first-person POV. Mira was cast out from her country, and as a foreign-looking foreigner, she stands out in her new country (and not in a good way). She joins the Glittering Court not specifically looking for a husband, but wanting to escape a certain lifestyle - and to be able to pay off her brother's debt. But then Mira gets herself involved in dangerous situations to help others, and suddenly it's not just about the Glittering Court, or her brother. Mira's life is over if she is caught - but this savvy girl isn't about to get caught. I adored Mira in the previous book, so I was really happy to see that she would be the protagonist of this book. She is tough and headstrong, brave and persistent. She goes after what she wants with no fear, and she doesn't think twice to help others, even if that means endangering herself. Mira is every bit as complex and likable as I expected her to be. I liked her relationship with Adelaide. The two become very close friends and they share a great bond of friendship and sisterhood. No cattiness or pettiness comes between them, even though they are technically competing against each other within the Glittering Court. Tamsin is a good friend but she is also very competitive and looks out for herself. I'm very interested in seeing more of her story (hopefully in the next book) - she isn't totally likable but she is an interesting girl. Grant Elliott is the other important protagonist in this book and I liked him a lot. He is so clever and sneaky - he has a disguise and a face for everything. He seems like he has no softer emotions and doesn't like commitment, but he is a good guy and he softens a lot. He is a smart protagonist and I liked following his moves. He and Mira are the couple of this story and I liked this pairing, though I would have loved to see more physical interaction between them. They are a great pair on paper, with lots of spark and passion between them. I wanted more kissing! I'll talk about the plot and the story itself in the next section. Overall, the story moves along and I wasn't in danger of DNF-ing the book. The ending is very fast-paced but ends well, especially for Grant and Mira. The ending was satisfying and I definitely want to see how the series continues, with the next book. There were a couple of things that I wanted more of, as general as they'll sound. I honestly thought the story moved too slowly. Like I said before, I wasn't in danger of DNF-ing the book; however, I was bored at many points during the story. The pace was just too slow and the story wasn't keeping my interest. I should have finished this book two months ago in May, but I wasn't feeling the story then, and I really wasn't feeling it now. The thing is, this book is big, the story long. I usually don't mind long stories/big books. But you really feel the length, with this one. The story takes place over months, but I felt like parts of the story could have been dropped. There was nothing important happening at X, Y, and Z points, but at A, B, and C, too much was happening, and sometimes the "too much" didn't seem to make sense together. I know none of this is really making sense but the long and short of it is that this book was a little on the boring side, with slow pacing and a meandering plot. Honestly? I don't even know what Grant and Mira were doing together (in terms of the subterfuge and gathering of information). Grant hires Mira to do some covert spying - but I can't even remember why, to what end. It's so bad, when you don't even quite grasp one of the biggest points of the story. I don't know what Grant was looking for, or what Mira was fighting for. Notice how vague my summarized synopsis was, at the beginning of my review (not the Goodreads synopsis)? It's because I either didn't know things or forgot things. Which is bad, because it means I wasn't interested. The romance was another thing I wanted more of. Grant and Mira have such chemistry between them - you can feel the tension and the passion. But there were so few actual kissing and physical scenes, and none of them had nearly enough detail! I wanted more making out! For such passionate and compatible characters, there really needed to be more (steamy) kissing sessions. I wanted to feel the romance, not just emotionally! Even emotionally, I wanted more. At least there wasn't a love triangle! I really didn't care for Tamsin. She's an interesting character but she isn't totally likable and some of her words and actions in this book kind of make me dislike her a bit. I almost wish she hadn't been a part of this story. But, parallel stories, so she had to have been. Look, overall, this book is an okay companion sequel, definitely not a bad book. But it comes across as mediocre and forgettable, especially if you put it up against The Glittering Court. I loved the parallel storytelling, especially since I forgot most of what happened in The Glittering Court. But Midnight Jewel, in general did not shape up next to its predecessor. Mead fans should read this book, especially if you've read The Glittering Court. It's not a bad novel! Just... not super great. I wasn't really impressed, or invested, or totally interested. Which is sad, because I adored Mira and really wanted to love her story. Especially with such a yummy male protagonist opposite Mira. Grant is all kinds of awesome, and swoony. Anyway, Mead fans, go for it. 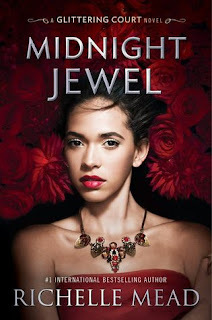 People who aren't a Mead fan, or who haven't read The Glittering Court, you can skip Midnight Jewel. The first book was fabulous and I recommend it, but I don't really recommend this book. 3 stars. Again, this wasn't a bad book, and there is a huge possibility that it was just me, in terms of my "mehhh" feeling. But. I don't think so. This book didn't have the same spark that The Glittering Court did. Something about this story just wasn't as satisfying or interesting. But that's okay! I'll be looking out for the next book, hopefully next year. I sort of felt this way about the first book there were points I felt like it dragged a little bit and could have had more action and anticipation although I did enjoy The Glittering Court. Great review! Too bad you ddin't enjoy it as much as The Glittering Court. Sorry this one wasn't better for you. I wasn't a big fan of the first book in the series and wondered if I should try the second one but I think I will have to skip it after reading your review. A shame you didn't have a better time! This is a series I'm curious about, but maybe I'll wait until it is finished to decide if I should read it. I found The Glittering Court to be terribly slow in parts. It was a huge disappointment for me because I expected way too much from it. So I was eager to start this one since the story sounded a little faster paced but also a little hesitant. I don't think I'll be rushing out to read this one right away. At one time Mead was an auto buy author for me... But lately I don't know... I wasn't a fan of The Glittering Court but I think it was because it wasn't what I was expecting AT ALL. I had high hopes for this one! I'll still read it because I too loved Mira. I wasn't expecting to read the same timeline although I do think it will be interesting but I was kind of hoping for a continuation more so... But now I've thought about it I'd also like to know where Mira was and what was going on. Definitely still reading this one but I'm glad I sort of know more of what to expect. Anyway, I'm glad you didn't hate it!